Want a light meal that's still high in quality? Try this recipe made special by a PDO oil. Clean the parsley carefully, remove the largest stems, then wash and dry it and chop it very finely with a half-moon chopper. Fillet the anchovies and rinse off the excess salt under running water. Also rinse the capers, squeeze them thoroughly, then dry the anchovies and capers on kitchen paper. Peel the gloves of garlic and remove the cores. Chop all the ingredients finely. 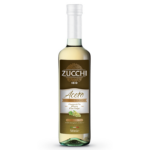 Wet the bread with Zucchi white wine vinegar, squeeze it thoroughly and pass it through a sieve. 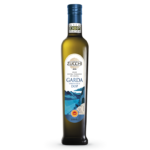 Pour all the chopped ingredients into a bowl and mix very thoroughly with the Zucchi Garda PDO oil, then add salt and pepper. Add the sieved egg yolk and stir carefully. Cut oven-proof plastic wrap, or if this is not available greaseproof paper, into 4 large squares with sides of 25 cm. Wash and dry the prawns. Place the prawns on the sheets of plastic wrap or paper and season them with the sauce made earlier. Close the parcels, place them in an oven preheated to 180°C and bake for 15-20 minutes. When cooked, place the parcels on individual plates and serve at once.